Last weekend I was invited to a friend’s house on the South Coast. The weather was ridiculously perfect and, as we found out later, a great contrast to cold rain in Canberra. As it was, we enjoyed multiple beach walks. 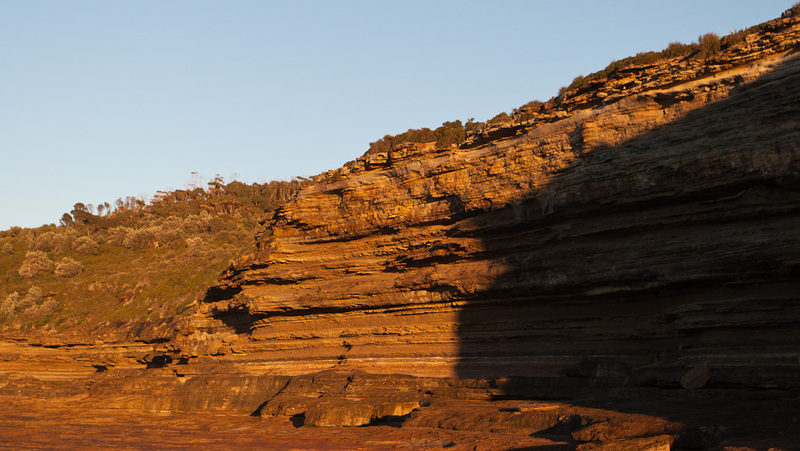 On the first walk we came across this imposing rock wall, located between Merry and Pretty Beach. When I first saw it, it was completely in the shade, but I figured if I got up early enough I should be able to have a go in the early sunlight hitting the rock. The next morning I just made it in time, and only because the tide was going out again. I love the colours and the strata in this rock. And it makes you feel so small when you stand in front of it. On our way back from our first walk we stopped for a quick view from a friend’s deck. I was scanning the ocean with a pair of binoculars and bemoaning the fact I had missed out on whales yet again when I suddenly spotted a spout and a breaching whale. There were quite a few migrating north and it was wonderful to finally see them with my own eyes. Later that afternoon, on another walk, we spotted a pair of dolphins riding the waves into the beach. I was to late to capture it as a photograph, but the vision is imprinted on my memory; they looked like a pair of delinquent teenagers playing in the surf. 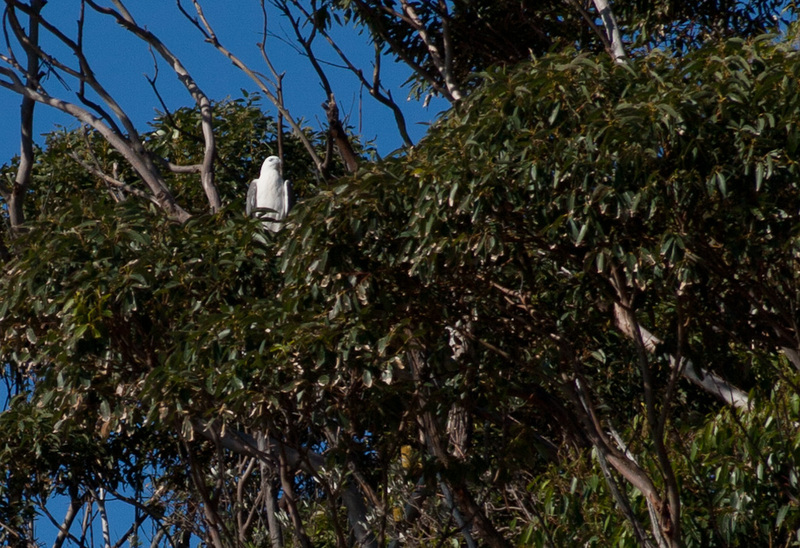 But the first wildlife I spotted on Saturday morning was a sea eagle, who wasn’t too keen on my camera lens. As soon as I got near, he flew off and kept circling, but never coming near again. He did come around by the side of the house later on, teasing me with proximity, but never a chance to take his photograph. I’m sure he was giving me the ‘bird’ on his flybys. Little did he know that I actually did get him in the first shot, so I’m breaking my rule of only one photo per blog entry to show him off; after all he is such a beautiful bird! Sounds like you’ve been doing a bit of walking. Jo headed off to do Mont Blanc in France and I am so jealous. I’ve done several multi day hikes around here since returning from NZ, which have been beautiful. Looking forward to Patagonia, are you still keen? February? No big walks here for me at the moment, but am still keen on Patagonia. I should know more after mid-September of how that might work out. Will keep you posted!